If you are an existing customer click here for special upgrades to your website including a mobile version, gallery, Facebook or Twitter feed, guest book, hit counter and other extra pages. If you have a website with me already but feel it’s a little old now or you want a change then you can even swap your old website for a shiny new one! To order your website, choose a package from the selection below. You can view the template for that particular package by clicking on the image to the left of it (please bear in mind that your new website will differ slightly from these templates depending on your order details). Click ‘order this site’ next to the package that you want. You will then be asked to enter your details (i.e. working hours, fees, schools that you pick up and drop off to, domain name required etc) into a simple form. By the way, your domain name will want to be something like your business name. 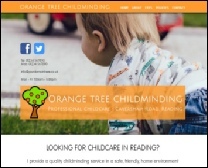 For example treehouse-childminding.co.uk or paulineschildcare.co.uk. If you leave it blank on the form I will help you with this if you’re not sure. Please also look at the extras page as the form will ask you if you would like any of the extra features offered to enhance your website such as a mobile version, hit counter, photo album etc. Also you may want to go for the optional Search Engine Submission Package which greatly enhances your chances of getting a good ranking in Google, Yahoo, Bing etc. Most of my customers go for this and it has achieved great results up to now. You also do not need to enter any card details - you can make your payment via PayPal, bank transfer or cheque. This is a stunning design. It is unique in the fact that it has animated clouds that drift ‘behind’ the main pages making it a joy to look at. It also features a special dynamic slideshow (with captions) on the home page that allows up to 6 photos to be continuously displayed. Because this website is slightly more complex to create than most of the others I have priced it accordingly at £149. You will also need to be able to email me with 6 large size photographs for the front screen slideshow. If you don’t have any then I will supply them from my stock photos. Also, because of the nature of this fantastic design, there will be no colour options available. The colours are as shown in the sample. This brilliant fun design is based around a cartoon nature scene with an image of above and below ground shown on every page. It’s very eye-catching and a great choice for both childminders and nurseries. Some of the photos and text at the top of each page are dynamic as well and slide away after a short time as new photographs replace them, or you can click on the arrows to move to the the next photo/text. As usual, galleries and hit counters etc can be added for not much more - see my ‘extras’ page for ideas. This is a new state of the art design and very modern. It is built in layers that move over each other as you scroll down the website. This visually stunning website is a joy to watch - try the demo above to see the text and graphics ‘hover’ above the giant photos in the background - the photos also move but slightly slower giving a parallax effect to the viewer. You can supply the main large photos should you want to, otherwise I will use my stock photos. A fantastic design for childminders and nurseries alike or anyone who wants to impress and leave others in the shade! This is my most modern design I think. It’s exciting, big, bold and eye catching and I’m proud to present it to you at a phenomenal £189! I cannot see any other web designer offering a website as good as this for anything under at least twice as much as I’m offering here! 3 massive photos alternate on the home page, while scrolling down reveals more big and bold photos, text and interactive boxes. You can keep my 3 photos on your own site but you can email me your own should you want to. This one also has 6 pages (I throw in the EYFS page). My most challenging but rewarding website yet! Ideal for nurseries and childminders but easily adaptable for other businesses. Follow me on Twitter and Facebook to keep up with latest developments. I update regularly with links to all my latest websites and updates. This design is quite recent and as such not many customers have this one. I personally think this one has a great look and along with the footer which is always at the bottom of each page, the building block letters look great at the top. Of course you don’t have to have the building blocks and if you have your own logo I can use that instead! The green hills on each page, the large lettering down the left side and the honeycomb background give this design a quality feel. This design is probably my most popular one at the moment. The cartoon animals give the website a lovely child-friendly feel with cows, sheep and rabbits taking centre stage and a rainbow poking over the hill. The children seem to love this one! I also use elephants, giraffes and monkeys so if you would prefer those animals then let me know. If not then I will decide on which ones to use depending on your choice of colours and/or your domain name. Extra pages can be added to any of my websites should you want any for just an extra £10 per page. The ‘Dino’ design is one of my most popular templates. It is very clean and doesn’t use cartoon images within the site like some others. It is great for large amounts of information or photos should you have them. It is also good if you have a large logo as there is plenty of room on the pages to incorporate this. Don’t worry if you do not have a logo - I will design you a simple one to get you going. This design is also good for nurseries too and has bullet points at the bottom of each page. This lovely design is based on a retro theme with bunting across the top of the home page and a background of wallpaper hanging up behind, giving the site it’s ‘shabby chic’ look. The ‘gallery’ page is just for demonstration and costs £10 extra should you want it. Each of the 5 standard pages has a different photograph at the top so it’s advised to send at least 5 photos if you would like this website. 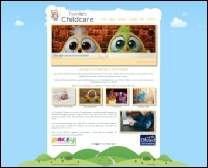 With room at the bottom of this template for more ‘at a glance’ bullet points, which give the viewer a quick insight into your childcare business, this website is a great choice if you don’t want your website to be too ‘cartoon’ like. Also a popular choice for montessori childminders. The idea behind the ‘Josie’ design is a very clean page built up with coloured boxes that contain the information provided along with any photos that you want to use. It’s mirrored reflection of the title gives a classy touch to this one. The large buttons down the right hand side of the home page give this design makes it very easy for the viewer to navigate around the site and is also very pleasing to the eye. 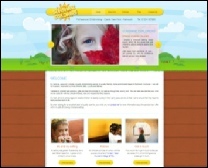 This one is a very professional looking, glossy website which many find to be their favourite design of all my templates. ‘Taylor Made’ is about being big and bold! You have a large photograph in the centre of the home page which shows your viewers exactly what your business is about before they even read the text! You can supply the photo if you want - if not I’ll use one of my stock ones. This can also be made to fade into other photos if you choose the ‘home page slide show’ from my extras page! The cartoon aliens at the bottom again add a ‘fun’ element to this website and the large buttons down the left hand side make it very easy for anyone to navigate their way through without problems. This makes this website a great choice for any childminder. The ‘Mushroom’ design is a very classy, modern design - a beautiful website template to suit those childminders who do not want a ‘kiddie’ type website with cartoons or child-like images! The photos are all in stunning black and white - you can supply them and I can convert them to black and white - or if you would prefer them colour just let me know when you order. If you don’t have any photos I can supply them for you - easy! If you want the main photo to be a 6 photo slide show like the ‘clouds’ one above then this is an optional £20 - just let me know when you order!